More than 180 non-native aquatic species such as plants, animals, fish and microorganisms have entered the Great Lakes to date, and the impact of many of these introduced species can be catastrophic for native ecosystems. When the spread of a non-native species risks damage to the environment, human economy or human health, they are called invasive. Invasive species can alter the food web, affect the cycling of essential nutrients or even remove these nutrients from the food web altogether, dramatically altering or even destroying water quality. They can also change or destroy coastal habitat. As a result, native flora and fauna can be decimated as the invasive species crowd out, displace and eventually replace the natural inhabitants and their position in the food web. Further, changes at one level of the food chain have a ripple effect on all the other creatures and organisms, as all levels are highly inter-dependent. This can permanently alter the biodiversity of coastal wetlands. Invasive species are able to do this effectively because they travel to areas outside their natural environment. They typically can establish themselves quickly and reproduce even faster, often with extremely rapid expansion. With few natural predators in the new area, there is little natural control of their population and its spread. This is why invasive species are considered one of the largest threats to the health of the Great Lakes ecosystem. Examples of worrisome invasive species include the bamboo-like phragmites plant, zebra and quagga mussels, Eurasian water milfoil, and round gobies, all of which are now found in the Great Lakes, including in Georgian Bay. The Asian Carp is also a large and highly destructive species of fish, which has not yet managed to reproduce in the Great Lakes into the Great Lakes. But many scientists fear that warmer waters due to climate change may make it possible for this destructive species and other southern carp species to soon make their migration into the Great Lakes easier. Wetland Ecologist Dr. Janice Gilbert, provides her perspective on the top 6 invasive species threats for wetlands. Download the Dirty Dozen - a PDF document that outlines 12 invasive species that are urgent threats for Collingwood especially, but should be top of mind for all of Georgian Bay. Produced by Nottawasaga Valley Conservation Authority in partnership with Georgian Bay Forever, Blue Mountain Watershed Trust, Environment and Climate Change Canada, and the Town of Collingwood. Download Ornamental Grasses - a PDF document that outlines ornamental grasses practices that help protect the environment . Produced by Nottawasaga Valley Conservation Authority in partnership with Georgian Bay Forever, Blue Mountain Watershed Trust, Environment and Climate Change Canada, and the Town of Collingwood. In the summer of 2015, over 8000 kilograms of invasive Phragmites was removed from Georgian Bay coastal wetlands. We recently worked with 16 communities from the North Channel to the South including communities like Collingwood and Honey Harbour to help them identify, map, and remove invasive Phragmites. We are continuing to respond to requests from other residents and communities in Georgian Bay about how to deal with this dangerous threat to our coastlines and wetlands. 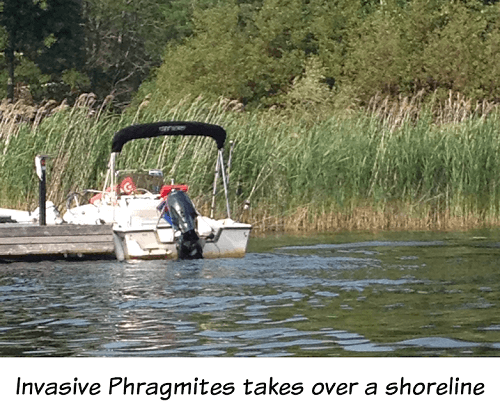 Please go to our Phragmites home page to learn more or contact us at georgianbaykeeper@gbf.org to learn more about how you can become a Phragbuster in Georgian Bay. Non-Native Phragmities is an invasive bamboo-like reed that is on a mission to take over Georgian Bay wetlands and decimate native shoreline biodiversity. If you’ve walked or taken a boat ride along the shore, you will have seen this plant. You may have even thought that it looked nice and reminded you of native ornamental grass. But don’t be fooled! This reed, if ignored, will grow into an extremely tall and dense mono-stand that will take over your beach, choke out native flora, fauna, and fish habitat and obstruct your beautiful view of the water. In essence, it will wipe out the beauty and functionality of your local ecosystem that supports many at-risk species, and continue to spread unimpeded along our coast. Collingwood to the North Channel—come together to fight this common threat. forward-thinking supporters at the RBC Blue Water Project, The Great Lakes Community Guardian Fund, the Schad Foundation, the Lake Simcoe Southeastern Georgian Bay Clean-up Fund, and individual contributors like you. Georgian Bay Forever knows it will take everyone’s cooperation to control invasive Phragmites, but we are confident that together, we will prevail! For information on how be a Phrag Buster and help your community control invasive Phragmites, contact Georgian Bay Forever by email at georgianbaykeeper@gbf.org. Lynn Short, Professor of Horticulture and friend to GBF, shares some tips in this short video on distinguishing the difference between native and non-native/invasive Phragmites. We recently worked with 16 communities from the North Channel to the South including communities like Collingwood and Honey Harbour to help them identify, map, and remove invasive Phragmites. We are continuing to respond to requests from other residents and communities in Georgian Bay about how to deal with this dangerous threat to our coastlines and wetlands. Please contact us at georgianbaykeeper@gbf.org to learn more about how you can become a Phragbuster in Georgian Bay, and go to our Phragmites home page. What exactly is at stake? A multi-billion dollar fishing industry and the biodiversity of the world's largest freshwater ecosystem. The really really big one as we all know is Asian Carp. Voracious filter feeders, these 20-kilo missiles strip the lower food web of phytoplankton and zooplankton leaving all the other aquatic life to starve. Government and non-governmental organizations are in agreement on what ultimately needs to be done: a barrier to keep them out from invading the Great Lakes via the Mississauga River system and the Chicago Sanitary Canal. Sadly, this issue is solely a matter for U.S. jurisdiction. However, it is enormously important for Georgian Bay Forever and Canada to keep the pressure on the U.S. to create permanent structures to keep the critters out. The recent announcement of $17.5 million by the federal government for the continuation of this battle to keep the carp out is welcome news to the agencies responsible for our fisheries. While sounding the alarm bells about the damage posed by Asian Carp to the many dozens of groups it has addressed, Georgian Bay Forever has been careful to explain exactly what is involved in erecting a barrier to keep them out. In addition to the canal system, there are other aquatic pathways along the almost 1,500 mile divide between the two basins. Closing them all, and that’s what you have to do keep the carp out, will cause significant disruption to regional economies. Indiana maintains it may take upwards of twenty years to safely and securely transition the system to achieve an ecological separation between Lake Michigan and the Mississippi delta. Immediate closure of the Chicago River would shut off 480 combined sewer overflows. To separate the watersheds, Chicago will have to redesign its septic and storm water systems. (Chicago put the cost to replace 900 miles of century-old water pipes, fix 750 miles of sewer lines and 140,000 sewer catch basins as well as upgrade the city’s four aging, steam-powered water pumping stations at four billion dollars.) Also affected would be the 20-mile, $250 million dollar levee system being constructed on the Little Calumet River in Indiana to protect homes there from flooding. These are not excuses to do nothing, but the very real hurdles that must be overcome. In the meantime the electrical barrier, ongoing electro-fishing, chemical poisons and netting are all underway. These activities are being coordinated by state authorities including the participation of Canada’s Department of Fisheries and Oceans. Find out all about invasive Phragmites and how you can help in community cuts. . In our interview with ecologist Dr. Janice Gilbert, we asked her what she considered the 6 invasives threatening the wetlands of the Great Lakes. Learn about some further resources and tools to identify and stop invasive species. Click here.